The examination application is not optimized for mobile devices. As a result, we recommend using a desktop or laptop computer. 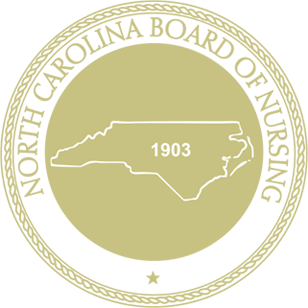 A multi-state North Carolina license is not issued when another state is claimed as the primary state of residence, however, a single state license will be issued until proof of North Carolina residency is provided to the North Carolina Board of Nursing. Individuals or foreign graduates, who are seeking Licensure by Examination, must have a valid Social Security number to be issued a license to practice nursing. While submitting an application for a Social Security number, you may take the NCLEX. No license will be issued until proof of the Social Security number is submitted to North Carolina Board of Nursing. Passing score: IELTS-overall score of 6.5 with a minimum of 6.0 on all modules. The English Proficiency examination expires two (2) years after the date the examination was taken. A CGFNS certificate or VisaScreen is also accepted to meet the English proficiency examination. For applicants to be EXEMPT from the English Proficiency requirement, the applicant must have completed their entry-level professional nursing education program in the United States, Canada (except Quebec), the United Kingdom, Ireland, Australia, New Zealand or the U.S. Territories of Samoa, Guam, Mariana Islands, and the Virgin Islands. The U.S. territory of Puerto Rico is not eligible for exemption. Copies of the education evaluation and/or English Proficiency examination will not be accepted from the applicant, but only from the official agencies. Even if your nursing courses were taught in English and/or English textbooks, the applicant will still need an English proficiency examination. There are no exceptions for this requirement. Do not send transcripts to the North Carolina Board of Nursing. All official transcripts must be sent to the Education Evaluation Agency. Once the education evaluation has been completed and a passing score received on the English Proficiency examination, then the applicant becomes eligible for licensure by examination. Assure eligibility requirements have been met, or all fees will be forfeited. Apply for licensure by examination ($75.00) with the North Carolina Board of Nursing. If you reside in another state or country, North Carolina Board of Nursing issued fingerprint cards and instructions will be mailed directly to you following submission of your application for licensure. Fingerprinting must be performed by trained law enforcement personnel. Contact your local Sheriff or Police office for assistance and additional details.